Another day of high winds and cold rain. Doesn't seem to be a great day on the horizon, but Hatteras weather does it's own thing sometimes. Check back tomorrow to see if things improved. South winds brought some warmer temperatures, but it is blowing a gale with gusts up to 38 mph or higher. Needless to say all boats stayed docked today. NC 12 is covered with sand from Frisco to Hatteras - be careful out there! Cold winds from the NE kept everybody in again today. Tomorrow's forecast promises rainy conditions but warmer. Check back to see if anyone gets out! Happy Thanksgiving to everyone! Here's offering gratitude to all who fished out of Hatteras Harbor this past year. We appreciate your patronage! 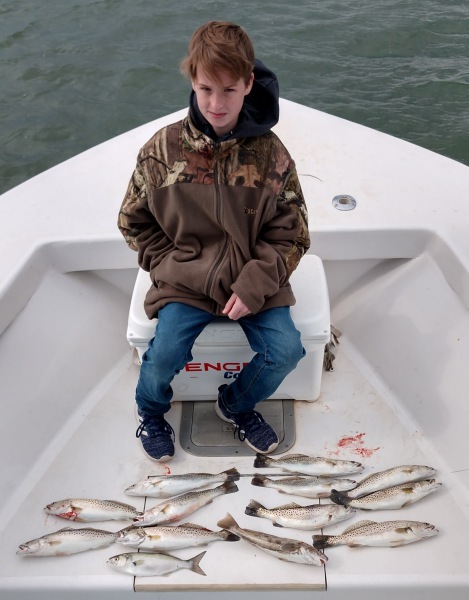 Inshore charters experienced good Speckled Trout fishing this morning. Several offshore boats went out commercial fishing for King Mackerel and one charter went out to the deep blue. We will be closed tomorrow and back to the grindstone on Friday - we are having a 50% off Sale on Friday only, so stop by and get an early start on Christmas shopping. Nicule Quinn of King George, VA; 31 lb. King Mackerel on Release. Ryan Martin of King George, VA: 38 lb. King Mackerel on Release. Janet Fahed of Montpelier, VA: 47 lb. King Mackerel on Release. Sean Fahed of Youngsville, NC: 37 lb. King Mackerel on Release. No takers for charters today but we did have a few of our captains commercial fishing. 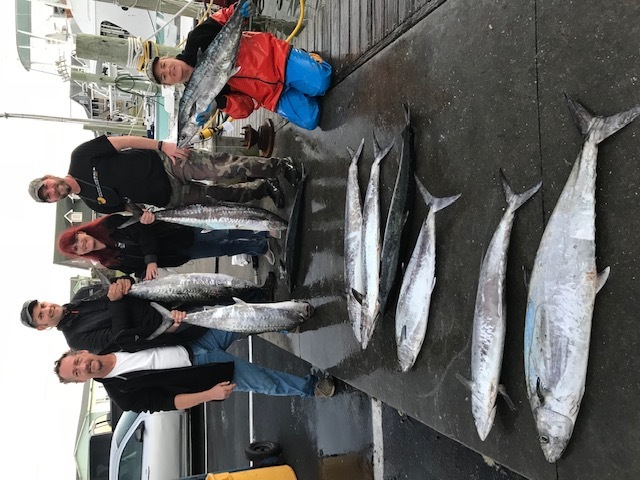 They found excellent King Mackerel and a few Blackfin Tuna. 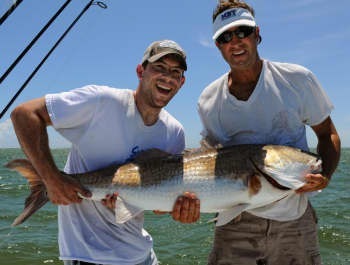 Inshore boats were finding limits of Speckled Trout. Our hours this week will be Wednesday 6AM-Noon, Thursday Closed "Happy Turkey Day! ", Friday 6AM-5PM. Another excellent day on the water with good catches of King Mackerel. 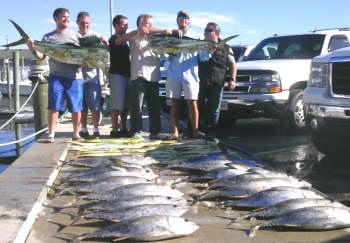 Fair Blackfin Tuna and a few Dolphin were also in the mix Offshore. Inshore boats were finding keeper and throw back Speckled Trout as well as King Mackerel. Adventure: Tony DeRossi of Roanoke, VA caught a 40lb King Mackerel. Michael Melillo of Alexandria, VA caught a 36lb King Mackerel. Good Times: Rosene Garrison of Lubbock, TX caught a 28lb Blackfin Tuna. Rhonda Garrison of Raleigh, NC caught a 35lb King Mackerel. Bite Me: John Bordwine of North Chesterfield, VA caught a 43lb King Mackerel. David Preston of Stuart, FL caught a 30lb King Mackerel. Mariah Fox of Stuart, FL caught a 45lb King Mackerel. Predator: William Cannon of Chesapeake, VA caught a 33lb King Mackerel. Greg Thomas of Moyock, NC caught a 40lb King Mackerel. Michael Gray of Midlothian, VA caught a 35lb King Mackerel. Eric Whitlow of Quinton, VA caught a 30lb King Mackerel. John Wicker of Moyock, NC caught a 30lb. King Mackerel. Excellent Blackfin Tuna and King Mackerel (lots of citations) fishing today with a few Yellowfin Tuna and Dolphin in the mix. Several boats out fishing Offshore on this gorgeous fall day. Don't forget to stop by for our Black Friday sale! Release: Merle Katalinic of Hampstead, NC caught a 37lb King Mackerel. Jared Green of Watha, NC caught a 36lb King Mackerel. Hunter Hairr of Salemburg, NC caught a 38lb King Mackerel. Harold Meadows of Hampstead, NC caught a 49lb King Mackerel. Sea Creature: Alex Erdin of Concord, NC caught a 35lb King Mackerel. Chase Erdin of Concord, NC caught a 34lb. King Mackerel. Carolina Girl: Shane Aaron of Hatteras, NC caught a 35lb and 42lb King Mackerel. Predator: Michael Maccharoli of Greensboro, NC caught a 31lb. King Mackerel. Craig Bonde of Greensboro, NC caught a 28lb Blackfin Tuna. Mark Mellor of Indian Trail, NC caught a 50lb King Mackerel. Thomas Mellor of Indian Trail, NC caught a 34lb King Mackerel. The wind let up enough today to allow a handful of charters to fish offshore - finally! Despite chilly temperatures, it was a beautiful day to fish the Gulf Stream and the fish cooperated. 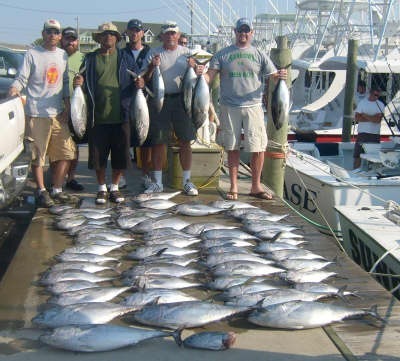 Anglers returned with scattered Blackfin Tuna (nice size, check out the citations) and King Mackerel. The Dolphin bite was scattered with gaffers being the exception. 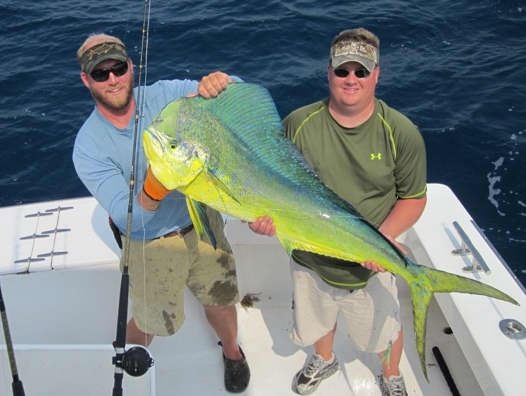 The weather forecast for Thanksgiving week seems like it will cooperate for the fishing crowd - don't miss out! Add fresh fish to your holiday menu - it makes a wonderful addition. David Hurst of Aylett, VA: 26 lb. and 27 lb. Blackfin Tunas on Release. James Turner of Richmond, VA: 28 lb. Blackfin Tuna on Release. Michael Hurst of Aylett, VA: 35 lb. King Mackerel on Release. Zachary Blizzard of Joppa, MD caught a 24lb Blackfin Tuna on Good Times. William Wilson of Stevensville, MD caught a 20lb Blackfin Tuna on Good Times. Gabriel Jensen of Fuquay Varina, NC: 32 lb. King Mackerel on Calypso.